I’ve (Dave Mackey) worked and do work on a lot of different projects. One of my challenges is narrowing my focus so that I can have significant forward momentum rather than diffusing my momentum into tiny fragments across a wide field. I’ve come a long way on this front, yet still have quite a ways to go. 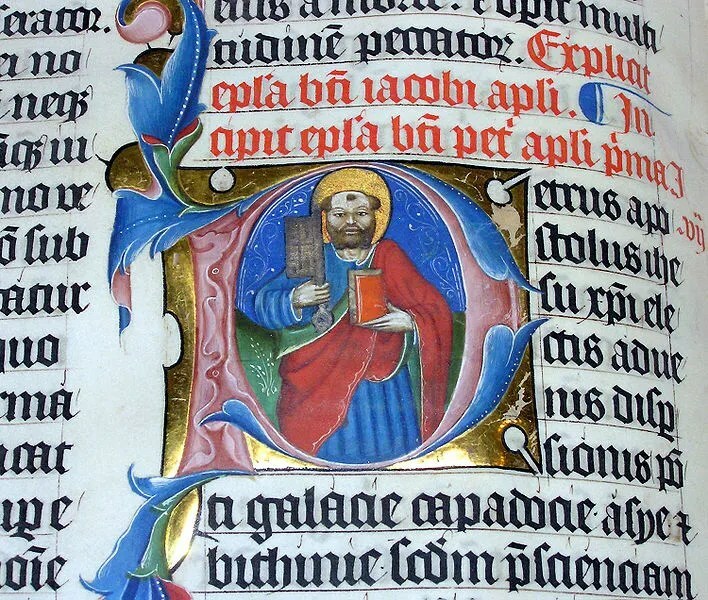 A photo of an illuminated Latin Bible from 1407 taken by Adrian Pingstone (wikimedia handle: arpingstone) and released into the public domain. When it comes to projects there are only a few that I am really, really, really committed to. The rest may come and go – but there are three which beat at the center of my heart. The first is Calvary Community Church (CCC). I’ve been attending and serving there for over twelve years now in one capacity or another. It has been a long, intense, difficult journey – but I have remained committed over the long haul. The second is Layered Bible – my endeavor to build a series of commentaries from an evangelical perspective similar to William Barclay’s excellent but more theologically liberal Daily Study Bible series. The third is the Open Source Scriptures Version (OSS) – an endeavor to build an open source, free, contemporary, commercial quality translation of Scripture. The idea for Layered Bible grew out of my ministry with teenagers at CCC. I was teaching them through books of the Bible – but I wanted more for them – I wanted to give them me throughout the week so I could provide insights on the historical/grammatical/social context of Scripture while at the same time leaving the interpretation and application primarily up to them. The idea for the OSS grew out of Layered Bible. I realized that there was no contemporary, free, commercial quality translation of Scripture available for my use within Layered Bible – and one of my intentions was to print the books of the bible individually (for ease of study) and to use the text throughout the commentaries. As you can see, each passion has grown out of the preceding passion – you could say they are all one passion, just unfolding over time. I’ve been working with CCC for over twelve years, with Layered Bible for ten or so years, and now the Open Source Scriptures has been a project on my heart and in my computer for perhaps the last year…I’m not in these endeavors for the quick flame and then flickering out – I’m committed…and I hope you’ll join me. With the OSS especially, I am looking to bring together hundreds of individuals (scholars and lay people) to create an excellent translation of all of Scripture (OT and NT). For now I’m starting with a simple architecture. I’m using WordPress as the Content Management System (CMS) for the website and Google Drive as the collaboration method for creating the translation. Thus far I’ve completed what I’m called version 0.1 of the first six chapters of Luke. You can view all of them on this site under OSSV. I’ve done this primarily to demonstrate my commitment to this project and the hours I have already committed to this project. I hope you’ll consider joining me. The published documents are only readable, not editable. If you want to actually be a collaborator you’ll need to contact me (e.g. leave a comment in the footnotes, shoot me an email, use a smoke signal, etc.) and I’ll give you permissions and see how things go – if the changes you are making are good (and not spammy/hackish/inappropriate) then I can increase the trust/permissions. You don’t have to work on the Gospel of Luke…that is just where I’m starting b/c that is what I’m leading a small group in next…and I have found that working on this translation has been an amazing study tool for me…I’ve been reading line-by-line from the WEB (the base of the OSS) and the ESV and merging as appropriate (and footnoting everywhere!) and then repeating the process with the results from above with the LEB. In this manner I see ever change in language and nuance and it forces me to think through why the differences exist. Example of OSS Process: Luke 1.